Most leadership teams believe they have a pretty good handle on how well the company is doing from a cost and productivity standpoint. They probably do know the people side fairly well being that it is relatively easy to measure: $Revenue/$ of labor cost or $Revenue/person is a standard measure, while time standards for all sorts of activities are very common. Attempting to understand how efficient their business processes are is more difficult and requires more effort. There are many good tools for this and we exclusively use Value Stream Mapping to understand how much wasted effort exists in a company’s business processes. In every business we have been in, we routinely find significant opportunity for improvement. In one company with sales of over $400M, we identified over $25M in business process improvements. That project could have yielded more benefit if we hadn’t bumped up against the limitations of the company’s technology. In every project we have done, we keep bumping up against the technology part of this equation. 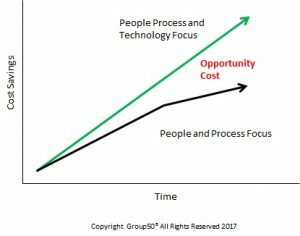 Our experience is that there is a limit to how much productivity can be realized when focused only on people and processes as shown in the graph to the left. There is another wave of productivity that is available to companies when technology is considered in the equation. We believe that this additional wave is potentially as large as the first wave of productivity improvements. Believing this isn’t a huge stretch as a result of seeing what technology has done to productivity over the last 20 years. Yet, many companies (especially middle market companies) focus only on People and Processes because of the significant amount of cost and effort required to implement new technologies. The rate at which technology is changing has become a significant challenge for senior leaders to understand how much more productive people and business processes could be if the appropriate technology was used in their business. They are further challenged because by the time new systems are implemented, the next generation of technology is already in the marketplace. We have seen many of our clients struggle with both of these issues and leave millions of dollars on the table as a result. The answer to the question is required in order to realize the next wave of productivity improvements that are available to every business. 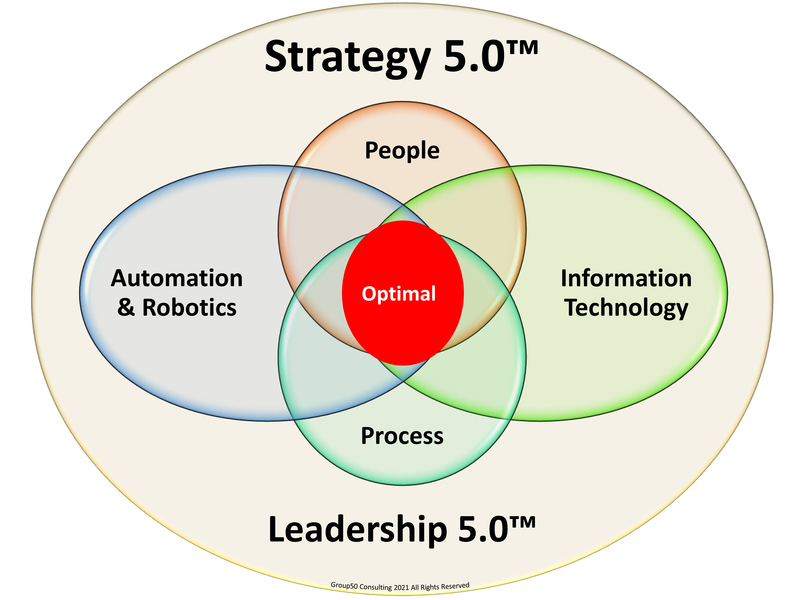 Group50’s Digital Technology Practice focuses on getting the answers to those questions and providing senior leaders with the technology roadmap that is appropriate for their business, marketplace and required for the next wave of productivity improvements. About the Author: Jim Gitney is the CEO and Founder of Group50® Consulting, a 13 year old consulting firm focused on working with middle market companies to significantly improve their productivity by leveraging people, process and technology as part of a company’s strategic plan. Group50 consists of consultants who have spent their careers in corporate America learning how to optimize businesses. 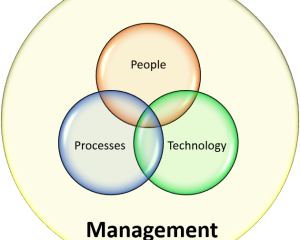 We specialize in working with senior leaders to develop and implement programs that leverage people, process and technology to optimize business performance.